Just a quick note about a book which I managed to read while minding a marquee in the pouring rain. The Festival has now finished, in a day of heavy rain and too few visitors. Oh, and thunder and lightning. Still, I did finish some books which I’ll mention here. 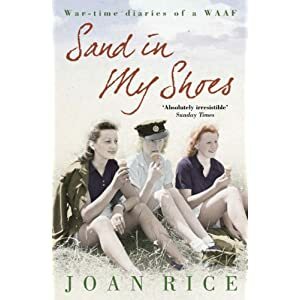 Today’s book is Sand in my Shoes by Joan Rice. It’s a jolly book in many ways, suitable to while away a (literally) rainy afternoon, but not in any way great literature.It is a diary of the war time progress of a WAAF officer. It starts in civilian life, follows her training as a photographic surveillance interpreter, and her journey on board a ship as part of a convoy. It is in the form of a diary, which is repetitive, with gaps and a frustrating lack of detail. She describes many flirtations with pilots and other officers, but does not really reveal her thoughts and feelings in anything like enough detail. It almost seems to be written in note form. I could almost wish that someone had used the material to write a proper account, or a novel, which would give the account balance. Instead I learnt more about scrounging furniture than what it was really like to experience that time as a young woman. I enjoy reading diaries as much as anyone (probably) but this was not a brilliant example. I’m looking forward to reading a friend’s book far more: Bedpans and Bobby Socks by Barbara Fox and Gwenda Gofton.